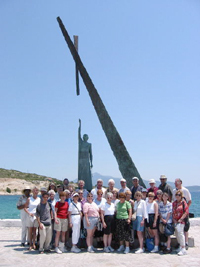 Thirty members (and guests) of the MAA traveled to Greece in late May to participate in the first MAA Study Tour abroad. There was a wide variety of participants, from high school teachers to retired professors, including two former presidents of the MAA as well as the current and former executive directors. All agreed that the trip met, and even exceeded, their expectations. Five of them agreed to write brief comments for FOCUS about their experiences. There were quite a few reasons that we were eager to participate on the MAA Study Tour of Greece. First, of course, as I have been teaching the history of mathematics for parts of the past 15 years, I was very eager to see Athens, Delphi, Miletus, and Samos. Second, there are a few places in the world that my wife Linda and I have always wanted to see. Greece has been one of those, ever since learning about it in our ancient history class way back in ninth grade. Finally, this trip provided us the perfect occasion to celebrate our thirtieth wedding anniversary. The focus on mathematics and the sponsorship by the MAA set this trip apart from other tours we?ve taken. The pre-travel readings and videos increased my interest in Epidauros and the Eupalinos Tunnel. The mathematical presentations that were arranged at various sites in Greece were a pleasure. We were treated as mathematical ambassadors from the USA at several receptions, and in fact we did carry out those responsibilities throughout our trip. Talking with colleagues from Greece was enlightening. Because of the special interests of our group, the aegis of the MAA, the hard work of those putting the trip together, and some serendipity, we had the chance to visit the Academy of Athens and three Greek universities, see and hear the model of the ancient Greek harmonium, attend a special museum exhibit entitled ?Is There a Solution for Everything? A Journey to the World of Greek Mathematics,? receive guided tours of sites in Athens and on Samos by archaeologists from the region, and visit Miletus. All those on the trip were pleasant and responsible, creating an atmosphere of general good will that was a delight. And, the fellow travelers included previous acquaintances and new friends that we can expect to see again in the future. Finally, an insight from Linda: this trip was of such great interest to even the non-mathematicians because so much of the focus was on mathematics and its relation to other disciplines: architecture, art, music, philosophy, mythology, history, astronomy, etc. Over the past few years, I have become quite fascinated with ancient Greek mathematics. When I heard about the MAA trip to Greece, I knew this was for me. It was a great trip, combining lectures on ancient Greek mathematics and travel to some marvelous sites. My favorite three lectures were on ancient Greek astronomy, the mathematics of Plato?s Academy, and the Method of Archimedes. The Greek mathematicians that we met were very welcoming and kind. They all seemed delighted to host a group of visiting mathematicians from the United States. We saw some marvelous sites. 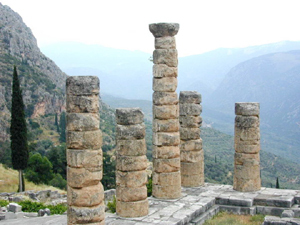 Some of the high points for me were: Delphi, where the ancient oracle used to dispense her wisdom; Olympia, site of the original Olympic Games; and the ancient city of Mycenae, the oldest site of all, home of the civilization about which Homer wrote in the Iliad. Greece is a beautiful country. I?ll always remember the gorgeous mountains, the beautiful sea, the vibrant people, and, of course, the great food. I wish I could do it all over again. What a joy this was! My trip to Greece was one of the most rewarding activities that I have experienced in both my personal and professional life. The planners carefully arranged an exceptional mix of mathematics, Greek history, mythology, entertainment, culture, food, and the list could go on. The tours across Greece and lectures at the university level were excellent. I felt comfortable participating in the formal and informal discussions. The guides and bus drivers were knowledgeable about all aspects of Greek life and culture. And I feel that my presence enriched the impression that our Greek colleagues had of American mathematicians. Special thanks to a host of MAA friends who assisted those of us who needed an extra arm. That?s what friends are for! The MAA should organize other similar activities for the membership. Reading a book or surfing the Internet provides information, but walking among the remains of ancient Greece is a once-in-a-lifetime experience! at the Pythagoreion, in Samos. When I tell my non-mathematical friends that I went on a ?mathematical tour of Greece,? they invariably look puzzled, seeing no connection between mathematics and Greece. But mathematicians know immediately about the deep roots that modern mathematics has in ancient Greece and are curious about what we learned. Some of our learning came from lectures by Greek mathematicians and astronomers, some through dialogue with them. One particular special occasion was a visit to the Academy of Athens. But the deepest insights came from just being in places where ancient Greeks lived and worshiped. A picture may be worth a thousand words, but actually being there is worth a thousand pictures. Although the ancient temples, fortresses, towns, and homes lie in ruins, it is still possible to imagine traveling back in time and seeing them as they must have been so long ago. 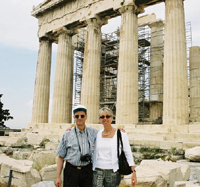 At the archaeological sites we visited, we were surrounded by the ancient Greeks? records of commerce, their tributes to winning athletes, and the many tales of the lives and loves of the gods and goddesses, all meticulously carved in stone. We were awed by the engineering feats required to construct elaborate temples and fortresses, and most particularly by the immense stone arches, still firmly in place after thousands of years. Day after day, for fourteen days, we were treated to a bounteous feast of ideas and images. Meal after meal we were also treated to the delights of Greek cuisine. And sharing all this with friends and colleagues made those two weeks even more special. This was definitely a trip to remember. Photographs courtesy of: Julius Barbanel Lisa Kolbe, and Liz Teles.